Yes it is owned by the Royal Armouries. It is of course essentially a German messer - Henry VIII was obsessed with Emperor Maximillian and wanted to copy lots of his stuff - this is likely why he created the Company of Masters of Defence, in emulation of the German Imperial-supported fencing guilds. The problem with those examples is that they could all more or less fit into the 'ethnic-fantasy' type of weapon shown in medieval European treatises (cruciform hilt, weird blade). In fact sabres are shown in lots of medieval manscripts (as well as exagerated falchions), but sometimes (often) it is to represent 'foreigners', or because it is a biblical story, or to denote Muslims etc. Just like funny hats, wacky shields and big noses. Because I have only a tangential interest in medieval sabres, it is difficult to judge the weirdness of those sabres. However it is interesting to note that two miniatures are from MSS Français 263 (1400-1405), an illustrated French translation of Titus Livius Ab Urbe condita (http://www.europeana.eu/portal/record/92099/18BF586B3470DF9FC3115FA9886F23AFE3AA0D71.html). So those images are basically depicting different events from the early Roman history (the second - folio 356 - battle, victory of Cornelius Lentulus?). So it isn't a biblical context or a necessity to depict some weird weapons to represent "foreigners", probably just normal military guys as seen at the end of 14thC (in 1402 the codex was already listed in a ducal inventory). Moreover sabres are shown as used by both sides, also in some other pictures we can see falchions and normal sabres. It is very tempting to say that those sabres were pictured due to the first (?) encounter of French knights with Ottoman forces during the Battle of Nicopolis (1396). I really have to agree with Urlich.I remember the period ,about ten and more years ago,when people commented illuminations with those strange looking messers with spiky and wavy blades in a similar manner unanimously saying that this kind of blades are for certain the figment of imagination,and then Italian storta sabre/messer was found-with exactly same shape of blade. I am quite sure that almost every weapon and armour depicted on contemporary pictorial sources did exist in reality! It is probably worth noting that sabres in the above French codex don't look fantasy weapons to me. Just compare them with the weapon in this fresco from the Uffizi Gallery, created by Andrea del Castagno (1420–1457) somewhere around 1450-1451, depicting famous Italian condottiero Pippo Spano. Almost the same period as the French codex, and this general fought extensively with the Ottomans between 1417 and 1426. So this could explain the presence of a sabre. "Dominus Phlippus Hispanus Descolaris ..."
AFAIK his "nickname" Spano isn't related to Spain (Hispania, Hispanus), it is from Hungarian word ispán (comes parochiae, comes castri, comes comitatus, comes provinciae). Count Pippo was the leader of a castle district around Temesvár, in the southern part of the Kingdom of Hungary. 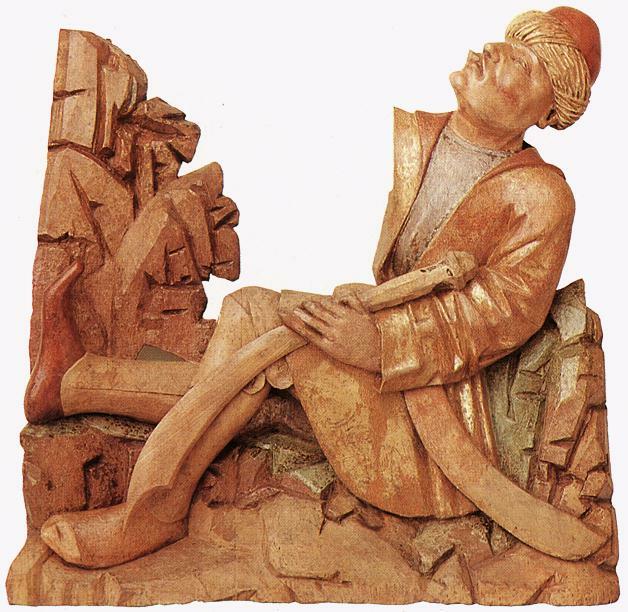 And his enemy: an Ottoman sipahi. Funny, due to the angle of the hilt and hand, I had always assumed that this is a straight sword being flexed, especially as it appears to be double-edged with a fuller. But I suppose it might be curved! There is an art book Italian Art, 1250-1550: The Relation of Renaissance Art to Life ... (1987) by Bruce Cole, saying "... sword which Pippo seems to flex with his bare hands ...". If we examine this fresco a bit closer, we could see that Pippo actually grips the hilt with his right hand and just barely touches the blade with his left hand (potentially the sharpest part of the blade): it seems that just his thumb and index finger are holding the blade, other fingers simply touch the flat. "In questo dipinto Pippo Spano è raffigurato con un’ arma in pugno: un osservatore scrupoloso può notare che non si tratta di una comune spada, bensì di una sciabola come quelle in uso all’ epoca presso le milizie dell’ Ungheria." It is difficult to prove that the sword in Pippo's hand definitely a sabre, but there are several things that support this assumption: the way of holding the sword, the asymmetrical pommel (! ), his prolonged contact with Turks. The Hungarian National Museum stores the so-called Szikszó sabre, IIRC the blade has a central fuller and two edges. I will check it later. BTW the earliest depiction of a hussar can be found on the scabbard of Szikszó sabre (between 1490-1510). Very interesting, thanks. Yes I think the pommel is the biggest supporting factor to arguing that this is a sabre. I'm not 100% convinced, but I think there is a good chance you're correct. A big sabre can be seen in the right hand of the executioner. This painting is mentioned in the beautifully illustrated Hussar Weapons of the 15-17th Century (2010) by Tibor S Kovács, Head of Armoury, Hungarian National Museum. He speculates that Italian got acquainted with sabres during the Italian Campaign of Lajos (Louis) I (1342-1382), against Venice in 1357. 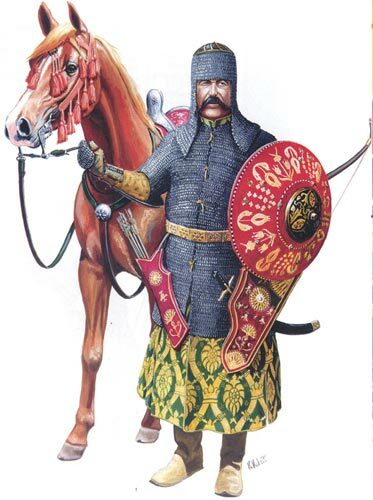 Highly likely that Hungarian light cavalry was equipped not only with swords, but also with sabres (mainly due to Cuman influence). Matteo Villani from Florence mentioned Hungarian troops in his Cronica (Chapter 54 (LIV), page 509). The Italian author said that they have two or more horses, and are equipped with a bow and arrows in a quiver, also have a long sword for personal protection ("e una spada lunga a difensione di loro persone"). Kovács speculates that this spada lunga could be the sabre seen in Beheading of St Paul. "Gli Ungheri sono grandissimi popoli..."
Wolin, Europe's biggest Germanic-Slavic Viking festival. Currently at the Christian Museum, Esztergom, Hungary. 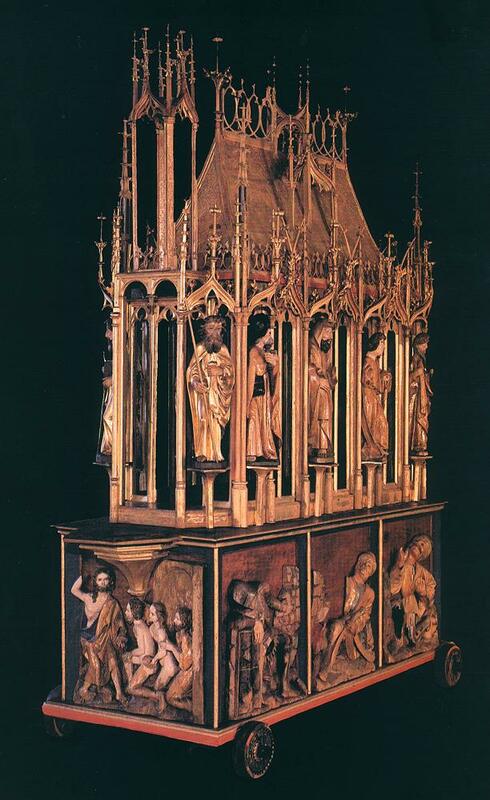 Johannes Aquila (around 1350 - after 1405) was a medieval painter and architect. This painting, one of the earliest European self-portraits, can be found in the medieval church of Martjanci (Hungarian: Mártonhely) in Slovenia. Local people (low-level nobility), who commissioned the building of the church, allowed him to create this self-portrait. It is interesting to note that despite his German name he wears Hungarian clothing and a typical Hungarian sabre depicted in the Chronicon Pictum (1360). The strange curvature of the scabbard probably could be explained by the fact that the painter tried to play with perspective. Ungarn, 9./10.Jhdt. Leicht gekrümmte Rückenklinge mit zweischneidiger Spitze. Eiserne Parierstange mit kurzen, flachen Armen. Konische Angel mit einer erhaltenen Griffniete mit großem, strahlenförmig gekerbtem Kopf. Gereinigter Bodenfund mit sehr guter Substanz. Länge 90 cm. Provenienz: Christies, Arms & Armor, Juni 1999, Los 21." Some sources are saying that this sabre is more likely from 7-8thC, similar to the Igar sabre (Hungary), the last third of 7thC - the beginning of 8thC, also similar to the finds from Pereschepin, Voznesenka, Glodoc, Djurso.